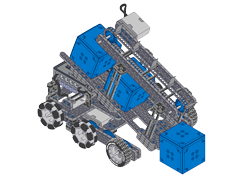 In mobile and competition robotics, an Object Manipulator is a mechanism that allows a robot to interact with objects in its environment. There are three basic categories of Object Manipulators: Plows, Scoops, and Friction Grabbers. 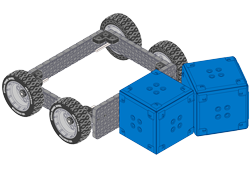 The first Object Manipulator category applies a single force to the side of an object. Plows move objects without actually picking them up and are by far the easiest manipulator type to design and build. 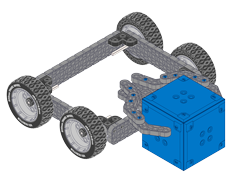 The second Object Manipulator category applies force underneath an object such that the object can be elevated and carried. Once an object is on a Scoop, it can be lifted and lowered relying on gravity to keep the object on or in the Scoop. 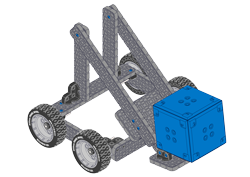 The third Object Manipulator category applies a force to an object in at least two places, allowing the object to be pinched or grabbed. Thus, Friction Grabbers have the ability to hold objects securely and are generally the manipulator type that provides the most control over objects. The most common form of this manipulator type is a pinching claw. Regardless of which category an Object Manipulator fits into, some are designed to handle single objects, while others are designed to collect and hold multiple objects. Any specialized Object Manipulator designed to collect and hold multiple objects at one time is known as an Accumulator. Accumulators, when desired, can allow for greater efficiency of an object manipulation system.